Revealed at NYCC 2016 – First ROBOTECH art by celebrated Robotech artists Jason and John Waltrip! Titan Comics is excited to unveil the first art from ROBOTECH – a brand-new series based off the legendary 80s animation by Harmony Gold – which was revealed at this weekend’s New York Comic Con. This brand-new cover was created by celebrated Robotech artists, Jason and John Waltrip, who are favorites to Robotech fans for their work on the Robotech II: The Sentinels, Robotech Genesis: The Legend of Zor and Robotech: Prelude to the Shadow Chronicles comic series. 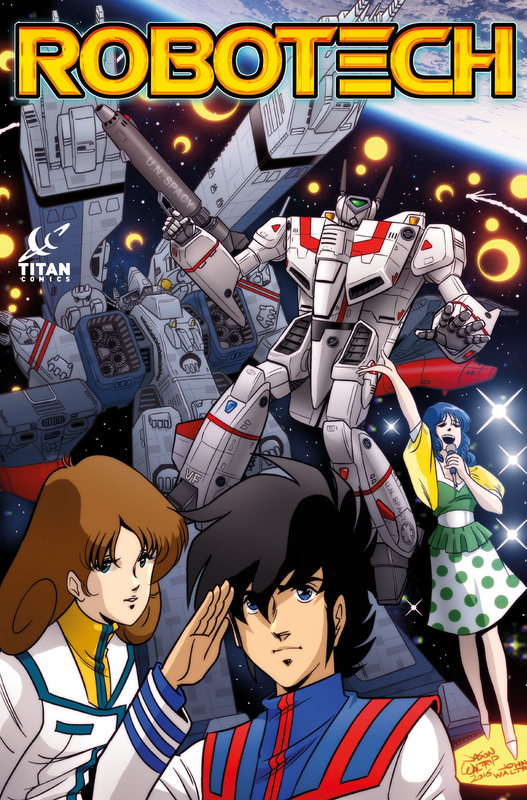 First airing in the USA in 1985, Robotech captured audience’s imaginations with its epic generational storylines involving war, romance, and, of course, the transforming Veritech fighters which defend the Earth against extra-terrestrial attacks. Produced by Harmony Gold USA, the original 85-episode series delved into humanity’s struggle against a series of alien invasions, from the gigantic Zentraedi to the mysterious Invid, battling for control of advanced alien technology that crash-landed on Earth. Now, return to the Robotech Saga for all-new adventures! Titan Comics’ Robotech series is set to debut in 2017.